Technology has always been one of my favorite topics. Although, I consider myself to be deeply connected to nature, I am also comfortable with the many powerful uses of computers & the Internet. Many people are afraid of the relentless progression of technological development, and worry about the potential loss of "human-ness" that will result from our dependence on tech. I see all technology simply as a set of tools- with the potential for good, bad, & even neutral, consequences. Humans have always had an integral, & often dependent, relationship with our inventions. There have been countless mind-augmenting technologies over the millenia, in the realm of communication. Spoken language, written symbols, the printing press, and the World Wide Web are all creations that have allowed the human mind to better connect with other minds. Email, text messaging, social media, and other electronic systems are slightly more advanced steps toward a form of technological telepathy. The fundamental goal of a human being, in relation to other beings, is simply to connect. What digital devices are allowing us to do is make these connections in increasingly novel ways, at instantaneous speeds. Right now, there is a Occupy Central protest in Hong Kong, advocating for representational democracy. The protesters are using the FireChat app to bypass the Internet & cell coverage, allowing peer-to-peer "mesh networking". This type of connection is extremely difficult for authorities to stop, since it is not reliant on a central or common network that can be blocked. This demonstrates that technology is a source of evolution, that is every bit as real as biological mutation. Technology is a transformative aspect of the human experience- adapting & changing to fit the situation, and much more rapidly than natural selection. As much as I truly appreciate the many positive uses for digital tech, there are just as many potentially hazardous outcomes. Unfortunately, I don't think humans will outgrow their capacity for maliciousness & desire for control of others before this technology develops. In addition to humanity's flaws, perhaps the machines themselves could be a subtly invasive force. Sometimes I imagine electronics as silicone creatures, that are evolving to latch on closer & closer to humans, trying to merge into us like some kind of parasite. Computers are getting smaller, and moving closer to our bodies, via smartphones & wearable devices. Eventually, they will be embedded in our brains and incorporated directly into our biological systems. 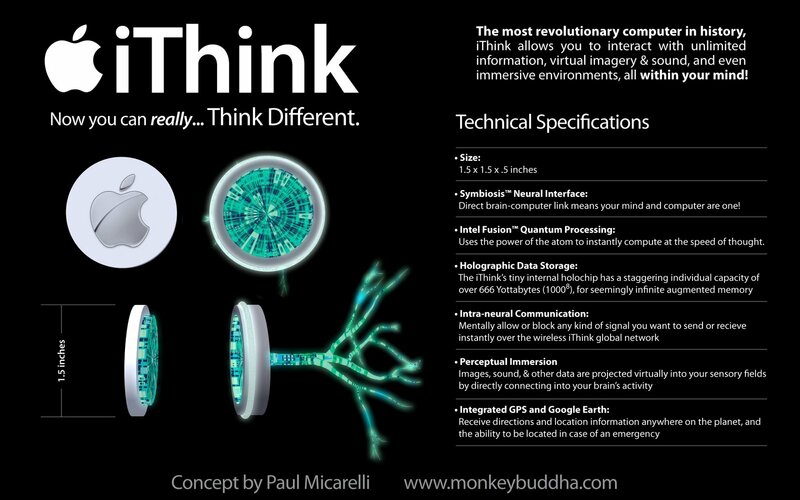 Then, we will become as dependent on the benefits of our iThink brain implant as we are on our mobile devices today. If this ultimate symbiosis between mind & machine happens, could it be a source of cognitive liberation, through limitless mind-expansion,... or a virtual trap for our consciousness? Regardless of the possible consequences, both science & the technologies it produces will continue to ceaselessly advance. This year, scientists have achieved direct brain-to-brain communication, so the era of truly interlinked minds is rapidly approaching. Then, perhaps instead of sending clumsy symbolic communications such as text or even the primitive monkey grunts of our voice, humans will be able to directly share thoughts among minds. It's seeing what other people mean." 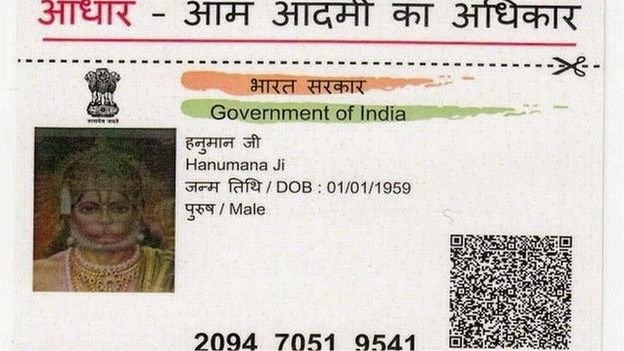 I saw this funny story about a biometric identity card that has been issues in India to Hanuman, the Hindu monkey god. 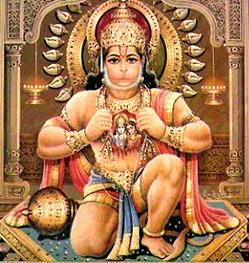 Hanuman is a revered character in the Indian mythological pantheon. I used imagery of Hanuman in my early depictions of The Monkey Buddha, for this blog. I saw this funny image on fusion anomalog. 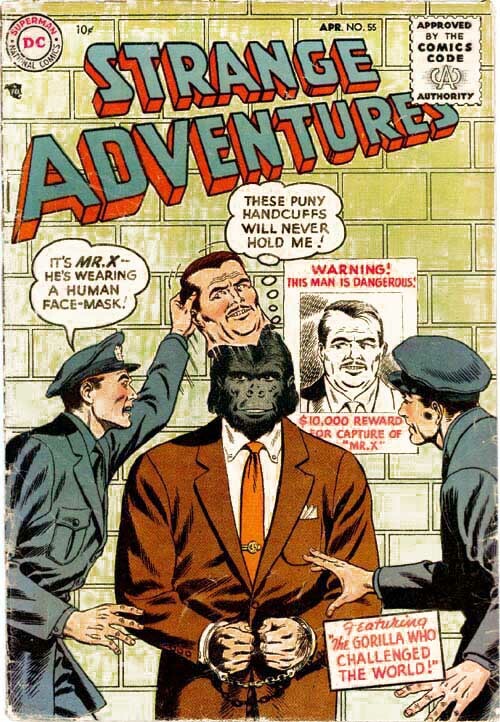 If someone were to try to un-mask The Monkey Buddha, a similar situation would occur. 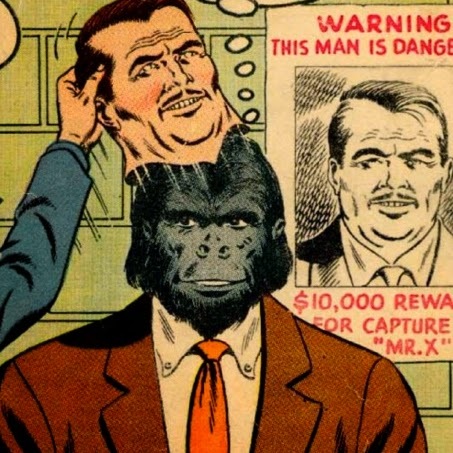 Underneath my "human" face, I am actually just a clever primate. I've recently finished another installment of one of my favorite video game series, Assassin's Creed. 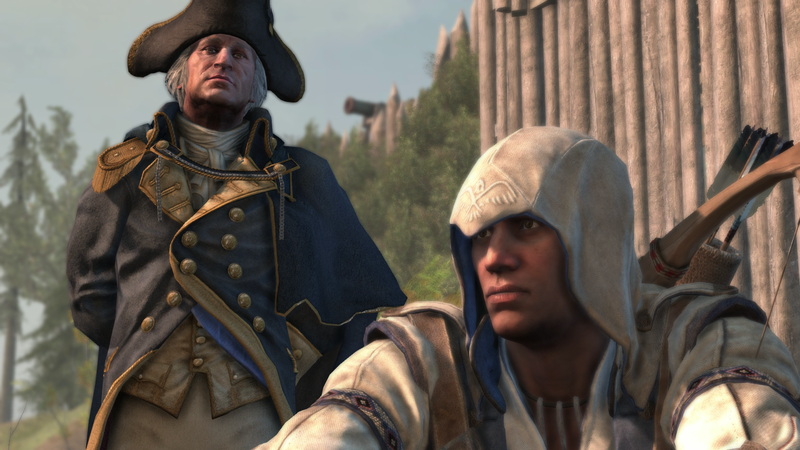 Assassin's Creed III is another virtual trip back in time to another era in history. 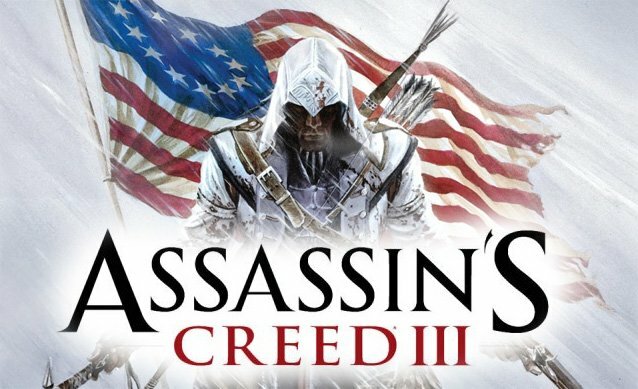 Unlike the previous 3 Assassin's Creed titles, which took place in the "Old World" mainly in Renaissance Italy & Constantinople, this game is set in the American colonies during the Revolutionary War. The enigmatic "First Civilization" still plays a role in the series, as a society of advanced humanoids who were destroyed by a catastrophic eruption of solar energy, many thousands of years ago. Their holographic personalities remain embedded in certain locations, to guide the human race toward preventing another mass extinction event like the one they experienced. There are various technological artifacts they left behind, "Pieces of Eden", which grant the user extraordinary powers. The historical conflict between the Templars & the Assassins is a race to find these powerful devices, in order to use them to further their own agendas. I think this series should really be called "Time Traveler", because the amount of detail put into recreating the look & feel of each time period is nothing less than astounding. My biggest complaint about the game is that I personally find colonial America to be an incredibly dreary time period. Even though there were many pivotal historical event going on, the architecture, dress, and lifestyles of the day were dull & uninspiring. Despite my personal lack of enthusiasm for the time period, the Ubisoft team did an extraordinary job of capturing the feel of America's early days. You get to experience first-hand the major events of the Revolution- The Boston Massacre, Paul Revere's ride, Lexington & Concord, and The Boston Tea Party. There are also many locations recreated with meticulous detail- such as, colonial Boston with the famous Green Dragon Inn where the Revolution was planned, British-occupied New York City, the encampment at Valley Forge, and several British forts. There is also an expansive wilderness with seemingly endless areas of forest, streams, mountainous terrain, and wildlife that can be hunted to use for trade items. The wilderness is also the location of a Native American village, which is the home to the main character, Connor. His real name is Ratonhnhaké:ton, and is half-European & half-Iroquois. He got the name Connor from the old Assassin, Achilles, who trained him at the Davenport Homestead- which becomes like a home base during the game. You actually start out playing the game as Connor's father Haytham Kenway, a British Templar. As Haytham, you travel by sailing ship to America, to start the journey that will lead to Conner's birth and eventually reunite father & son later in the game. The way in which the game has you travel to the colonies by ship & makes you feel like you are en route to the new land is a very immersive way to introduce the game. Besides the main characters, you also interact with some of the famous figures in early American history- including a raunchy Ben Franklin, Paul Revere, Sam Adams, Marquis de Lafayette, and even George Washington, who is shown as the powerfully charismatic (yet flawed) human being he undoubtedly was in real life. The gameplay is very much in the tradition of the other AC games, with stealth elements, easier free-running (with the ability to travel through the treetops), an array of weapons from the period including the customary Assassin's blade, and improved combat mechanics- which makes taking on large groups of enemies very fluid. There is also the added element of naval missions, in which you take the wheel of a large sailing ship to steer it and direct cannons at enemy vessels. At first I wasn't too impressed with the naval aspect, but as I played through more of the missions I really got into captaining the ship & sailing into the intense battles at sea. The main campaign of the game is characteristically expansive. Due the limited amount of time I devote to video games nowadays, it took me a couple months of sporadic playing to complete the main sequences. Unfortunately, instead of feeling a sense of wonder at exploring, as in Renaissance Rome & other locations like in previous episodes, I mostly wanted to just get through this game & finish it- so I could get the hell out of the dismal Colonial experience. This was probably my least favorite Assassin's Creed so far, for the reasons I stated above, but that doesn't take away from the monumental achievement that the production of this game represents. If you want to get a taste of the events & life in America during the Revolutionary War, there is no better way than Assassin's Creed 3. In my last post, I explored the unimaginably vast distances of outer space. The question facing us mere mortals is, "How do we travel across these seemingly impossible distances?" In the past I've posted the awesome charts, made by DeviantART user DirkLoechel, that compare the size of fictional spacecraft from a wide number of sources- such as the popular movies Star Wars & Star Trek, and video games such as Starcraft & one of my favorite games, Mass Effect. 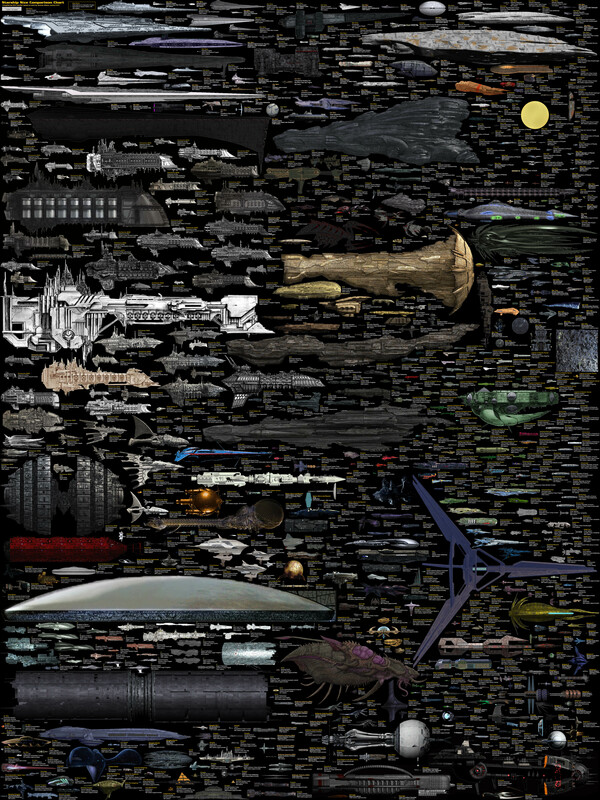 On Gizmodo, I saw (what he claims to be) the last update to this awe-inspiring collection of fictional space vehicles. They include ships of mind-boggling size, up to 24,000 meters, or almost 15 miles long! The beauty of building in space is that there really is no size limitation due to gravity fields or restrictions on the area that a vessel can take up. I love any visualization that helps me try to grasp the vast scales that exist in our Universe, from the atomic to the cosmic. This mind-expanding animation from the American Museum of Natural History is a virtual trip from the surface of Earth outward though the known outer limits of space. Consequently, it is also a trip back through time- to the earliest perceived period of our Universe's history. The farther "out" into the cosmos we look, the farther back in time we are seeing, as light takes time to travel thee vast distances. It is both humbling & awe-inspiring to consider that we are such a tiny, yet integral, node within the sea of infinity. In my last post, I talked about using the relatively new technology of 3D printing to create abstract, fractal objects. The beauty of this emerging technology, though, is that it can be used to produce any form that the mind can imagine. In addition to new, cutting edge applications, it can also be used to harken back to the 'cutting edges' of our prehistoric past. 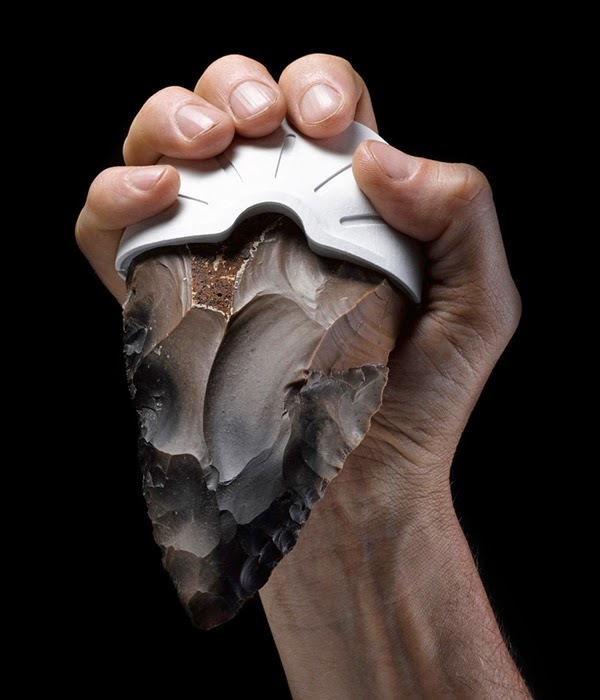 On Neatorama, I saw this interesting fusion of past & future, where designers have created implements to aid the use of ancient stone tools. In creating these modern additions to ancient technologies, the artists were able to better understand the sophisticated techniques our ancestors used to create these stone tools & weapons. In my last post, I wrote about the profound effects digital technology has had on communication. 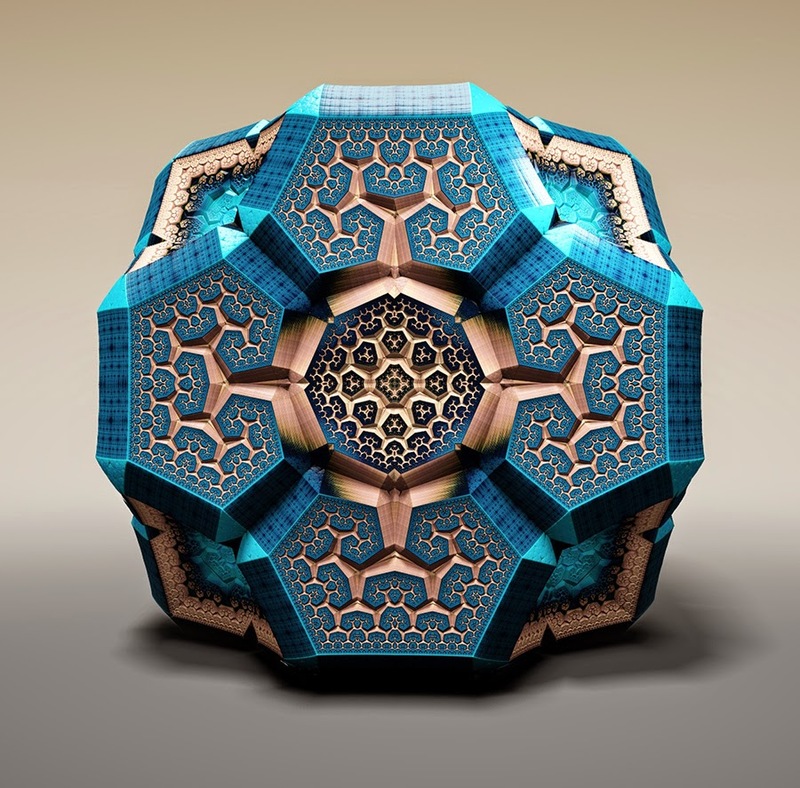 Art & design is another area where innovation in computers has led to the possibility of previously unimaginable creations. I've always had a deep interest in fractals. I think they are fundamental in understanding the nature of reality. Through iterative fractal software, it is possible to generate visual forms that would be impossible to render otherwise. With improvements in software & computing power, it's now also possible to create videos of these extraordinary fractal structures in motion. The very recent phenomenon of 3D printing now allows us to bring these impossible objects into the physical domain. 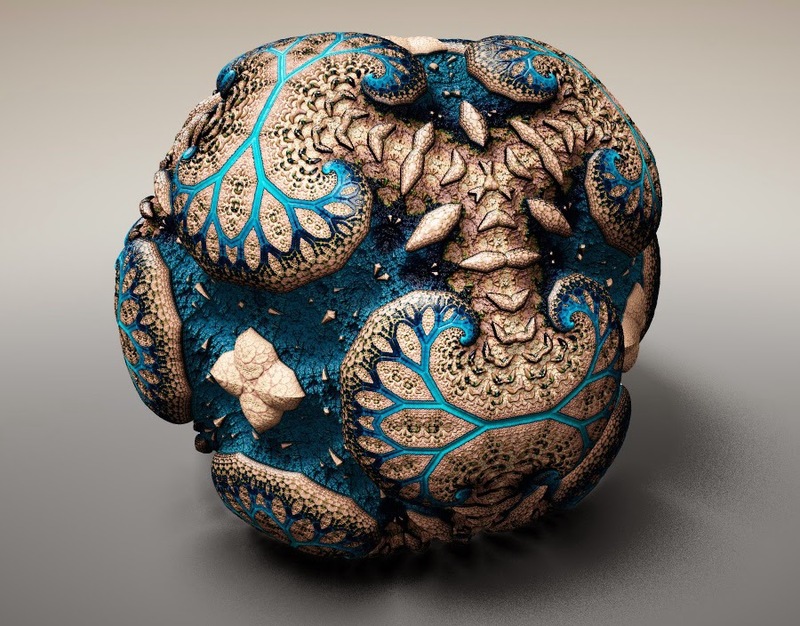 Here are some "Fabergé Fractal Sculptures" created by artist Tom Beddard on his website subblue. 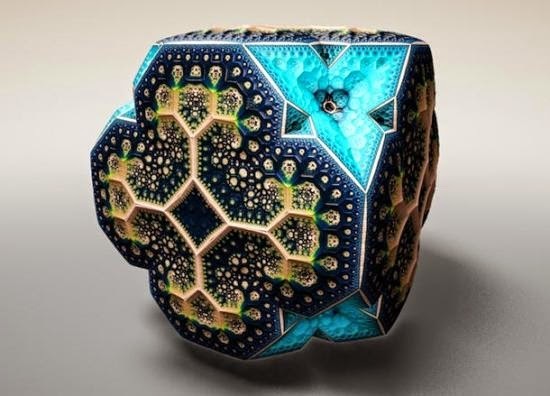 Tom is also the creator of the awesome fractal app that I downloaded & explore frequently, called Frax. These intricate sculptures are reminiscent of the kaleidoscopic, hyper-dimensional forms described by the late, great Terence McKenna. One topic that always seems to come up nowadays when I'm talking to people is the effect of technology, like cell phones & social media, on human interaction. I see these things as a tool that can be abused or used for meaning purposes. 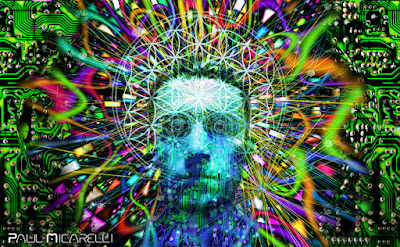 What is really happening is a form of virtual telepathy- where people are silently transmitting thoughts & ideas to each other immediately, across the entire world. It's simply a different form of communication, like vocalizing noises through the air, or exchanging ideas through writing. However, there is no denying that the ability to mentally engage with cyberspace is changing the way people socialize in "meatspace," or what we understand to be the "real" world. I've definitely noticed the tendency for kids (& adults) to become fixated on their mobile devices, as soon as there is any lack of immediate stimulation. However, I saw this funny comparison below, that suggests that maybe people have always been prone to distraction. Only now, it's easier with our gadgets to shift our awareness to something else. I also came across this funny comic below from the Bizarro Blog!, that shows the dichotomy of people's fear & love of the ever more ubiquitous cameras- that are uploading all aspects of the human experience to the hive mind that we call The Internet. Most people are still resistant to the idea of relinquishing their privacy, but as social creatures we feel the need to share our lives & experiences with the rest of the world. I like this version of the traditional depiction of man's evolution. It shows our ascension from monkey to a spiritual being of conscious energy. In 2006, My family went on a vacation to the Riviera Maya in the Yucatan, Mexico. While we were there, we visited the ancient Mayan ruins of Chichen Itza and saw the amazing art & architecture that the Maya produced. 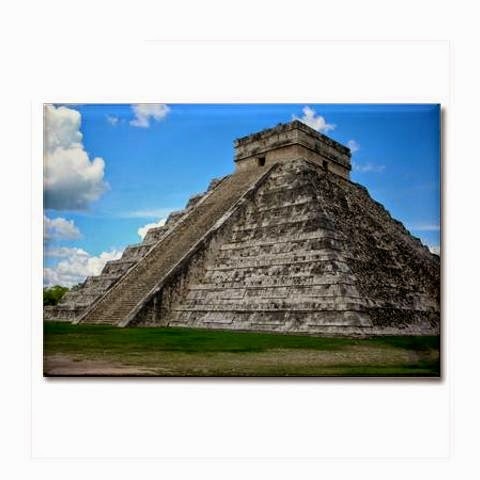 I took some pictures of the main pyramid at the Chichen Itza ruins, the Temple of Kukulkan. This was the feather serpent god, who was known as Quetzalcoatl to the Aztecs. During the Spring equinox, the shadow of the pyramid stairs creates the illusion of a serpent descending the temple. Also, when you clap your hands in front of the stairs, the echo sounds like the chirps of the sacred quetzal bird. It is truly an awe-inspiring piece of monumental architecture. I added one of the photos of this magnificent temple to my Cafepress shop, in the Photography section. You can order prints, posters & other items with this beautiful, mysterious building on it. On Saturday, I took my girlfriend to Evolvefest for her birthday. 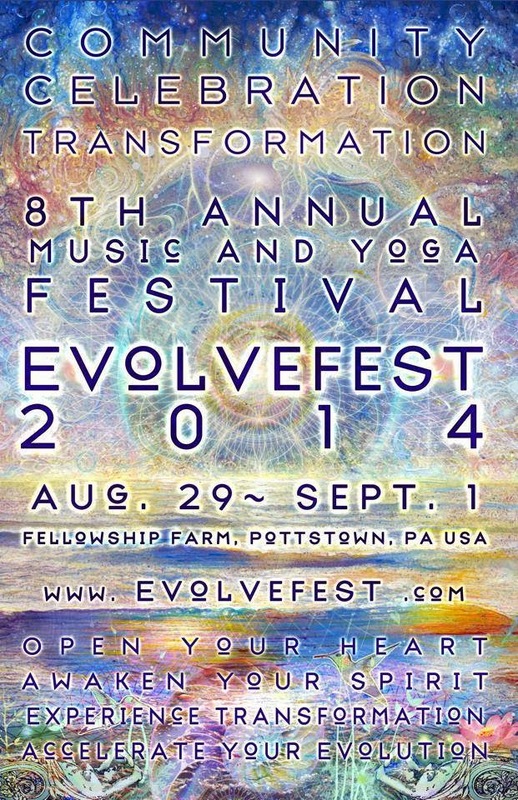 It is a festival of music & consciousness-raising activities, held in Pottstown, PA at Fellowship Farm. It was a very interesting experience, & we both really enjoyed it. The atmosphere reminded me of a 60's hippie commune, with many unique artistic & spiritually-minded people there. It's definitely not for everyone, but we found it to be an enriching experience, overall. There was a main stage with music playing throughout the day. At night, the stage set was lit up with projections. We participated in several activities, such as group yoga classes & Native American medicine wheel ceremonies. Much of the day was spent wandering around the grounds, checking out the various tents with vendors or services. There were tents with healing services, natural therapies, and even the Tesla Science Foundation- promoting the legacy of the great genius of the 20th century, Nikola Tesla. Much of the promotional material for the event, like the banner above, used The Flower of Life symbol in the design. This is the pattern of interlocking circles that symbolizes consciousness. I used this pattern for the game board in "Da Vinci's Challenge," the game I created. Behind the main stage, there was a giant Seed of Life symbol, which is the basis for the larger Flower of Life pattern. It was lit up, & cycled through different colors.